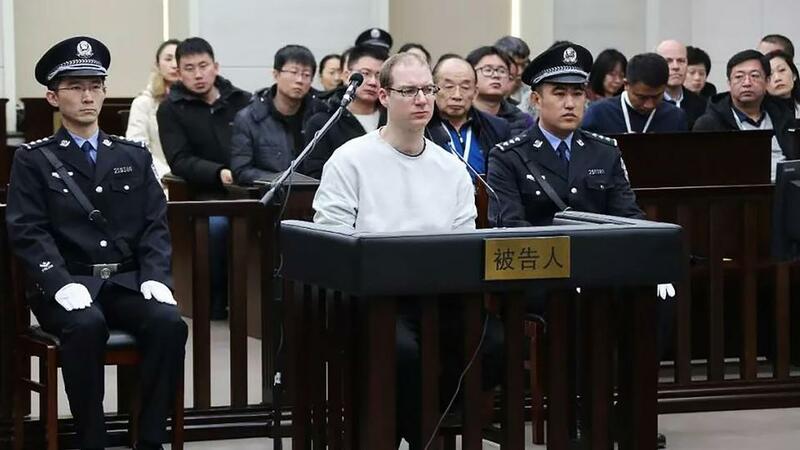 A Chinese court sentenced Canadian Robert Lloyd Schellenberg to death in a retrial of a drug smuggling case for which he was handed a 15-year prison sentence. A Chinese court on Monday sentenced a Canadian man to be executed for drug smuggling, prompting Canada’s Prime Minister Justin Trudeau to accuse China of using the death penalty arbitrarily. The ruling, and Trudeau’s reaction, could aggravate already sour relations between Beijing and Ottawa following the arrest of a senior Chinese executive in Canada and China’s subsequent detention of two Canadians. The Dalian Intermediate People’s Court in China’s northeast province of Liaoning re-tried Robert Lloyd Schellenberg, who had appealed his original 15-year prison sentence, and decided on execution, the court said in a statement. Trudeau strongly condemned Monday’s proceeding, suggesting that China was using its judicial system to pressure Canada over the arrest of Meng Wanzhou, chief financial officer of the Chinese telecommunications giant Huawei. In his strongest comments yet, Trudeau said, “All countries around the world” should be concerned that Beijing is acting arbitrarily with its justice system. “It is of extreme concern to us as a government, as it should be to all our international friends and allies, that China has chosen to begin to arbitrarily apply a death penalty,” Trudeau said. Schellenberg’s lawyer said on Monday he would appeal. “It is of extreme concern to us as a government, as it should be to all our international friends and allies, that China has chosen to begin to arbitrarily apply (the) death penalty … as in this case,” Trudeau told reporters in Ottawa. “Our thoughts are with Robert at this time. It is rather unimaginable what he must be feeling and thinking,” she said in a statement to Reuters. TRT World speaks to Chris Alexander, a former Canadian diplomat in Russia. China is not putting pressure on Canada by sentencing a Canadian to death for drug smuggling, and any suggestion it was doing so showed “rude contempt” of China’s law, its state media said. “Public opinion in Canada has claimed recently that China is ‘politicizing’ Schellenberg’s case, but what Canada is doing is actually politicizing law,” the Global Times said. China-Canada ties turned icy in early December after Meng was arrested in Vancouver on a US extradition warrant. Lu Shaye, China’s ambassador to Canada, suggested in a newspaper article last week that the arrest of Kovrig and Spavor was “China’s self-defence,” but did not give details. Earlier on Monday, China’s government dismissed Trudeau’s statement that Kovrig enjoyed some form of diplomatic immunity. St-Jacques said Canada should immediately call for a top-level meeting of foreign policy and security advisers from the two nations “to impress upon the Chinese side that they have to abide by international law”. William Nee of Amnesty International noted that drug-related offences did not meet the threshold of the “most serious crimes” to which the death penalty must be restricted under international law.